The alias of the registered server is shown here. 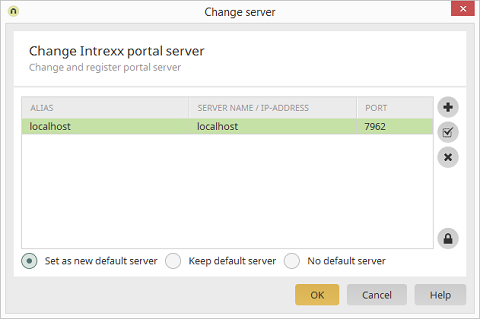 The system where the Intrexx portal server is installed can be entered by name or with its IP address. The port of the respective server is shown here. The port is set automatically and can usually be kept as it is. Adds a new row to the list where an additional server can be registered. The currently selected server connection is tested. Removes the currently selected server from the list. The highlighted server can be edited and the alias or server name, or IP address, can be modified. In case a server is not available when the Portal Manager is started, you can define one of the servers listed here as the new default server. The Portal Manager will be connected to this server automatically the next time it starts. The original setting is kept. None of the servers will be defined as the default. If no connection to the server can be established, please ensure that the computer to which the Intrexx Portal Server has been installed is operational. Additional possible causes are problems with the network connection, a missing installation of TCP/IP, or a defective network cable. The Intrexx Supervisor service must also be started on the portal server. Please also check whether the administrator of the server has chosen a different administration port manually.